Weekly drop-in English conversation group, moderated by library volunteers. Other special programs included health education, movie nights, spoken word, cultural demonstrations and exhibitions, literacy education, and a variety of workshops and activities for children. Boston’s Chinatown has been without a library since 1956. Boston Street Lab founders Sam and Leslie Davol live with their two children in Chinatown. As of January 2009, efforts to bring a branch of the Boston Public Library to the neighborhood were stalled. With the blessing of the Friends of the Chinatown Library, a long-time advocacy group, Boston Street Lab partnered with graduate students at Harvard’s Graduate School of Design to transform a vacant storefront into a temporary, community-based library. The purpose of the project was to give people the experience of a library, as well as model lighter and quicker ways of realizing needs for civic, cultural and community space. 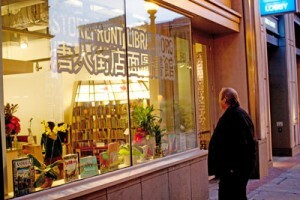 It was agreed that the installation would be temporary so that Boston Street Lab could borrow space and realize it quickly and inexpensively, and so that the Friends of the Chinatown Library could continue their campaign for a permanent branch of the Boston Public Library following the project. Partners in creating the Storefront Library included students at Harvard's Graduate School of Design, art and design collective Department of Micro Urbanism, students from Simmons Graduate School of Library and Information Science, Archstone Real Estate Company, and Friends of the Chinatown Library. Program partners included the Boston Nature Center, the Chinese Historical Society of New England, the Asian American Resource Workshop, READ Boston, the Boston Children's Museum and over thirty other organizations. See a full list of partners, sponsors, advisors, staff and volunteers here. 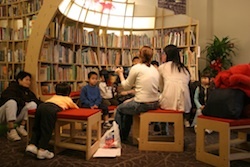 The Storefront Library successfully gave people—particularly children—the experience of a library in Chinatown. It also provided much-needed public space and increased the capacity of a variety of other nonprofit organizations to engage the public at street level and coordinate their work. The project was implemented efficiently and affordably, making use of underutilized resources, donations, borrowed items, and volunteers, without sacrificing quality. Boston Street Lab funded the project with cash donations from individuals and organizations. The remaining requirements for the project (including space, materials, equipment, services, and personnel) were fulfilled with in-kind donations, donated or borrowed items, and volunteers. Support for the Storefront Library was widespread throughout its three month operation. For example, the Mayor of Boston, many local and city officials, and a representative of the Governor of Massachusetts attended the Storefront Library's Oct 14, 2009 opening. The President of the Boston Public Library and members of her staff also attended and returned at a later date to see the Storefront Library in operation. Governor Deval Patrick awarded Boston Street Lab a citation for community service to the Chinatown community. The Chinese Progressive Association awarded Boston Street Lab its 2010 Social Justice and Innovation Award. All of this attention successfully generated a broader conversation about the importance of libraries to our collective public life at a time when many urban public library systems—including Boston's—are closing branches or reducing hours. a library is now included in the community's Master Plan, intended to express the community's vision and priorities for future neighborhood development. there has been increased attention to the issue, including press and statements by elected officials. 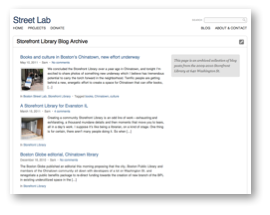 Groups around the country dealing with closing libraries are contacting Boston Street Lab. See latest project updates at top right of this page. Books from the Storefront Library have a new home, and there is now a library in Boston's Chinatown! The Chinatown Lantern opened April 2012 at 888 Washington Street, in space provided by the Asian Community Development Corporation. The Lantern library is based on the model of the Storefront Library, and is now home to all of the Storefront Library's 5,000 books. Here are some other libraries inspired by the Storefront Library in Cairo, Egypt, Allentown, PA, and Evanston, IL. Boston Street Lab gathered anonymous data by means of a library card application form. 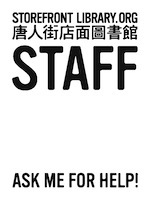 Feedback was also collected in handwritten form, in Chinese and English, on-site. Volunteers translated, entered, and posted the feedback. View the full data here. 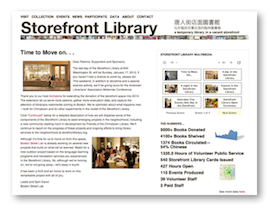 Visit the archived 2010 Storefront Library web site for a look at our daily events, demographic data, and photos. Get a sense of the day in, day out of the Storefront Library: browse an archive of our Blog Posts about the Storefront Library. Margaret (Maggie) Husak (Maggie is worked on developing and implementing Street Lab's Work in Progress. Maggie received her Master's from Tufts University in Urban and Environmental Policy and Planning. Prior she was Coordinator of Communications for the Harvard Green Campus Intiative at Harvard University. She is also a professional modern dancer and dance educator. She performs regularly with EgoArt and Weber Dance (based in Somerville), and with the Falling Flight Project (based in Cambridge). She has a BA from Brown University. Partnerships are fundamental to our work, and we invest in developing and maintaining these relationships. We partner with private and public property owners and managers who want to improve the streetscape experience, increase foot traffic, and create community benefits. We partner with government entities and community groups who have ideas for improved public spaces that we can help pilot and evaluate. We partner with nonprofits and institutions seeking ways to experiment with new program ideas, and we showcase their work in public space, increasing their reach, effectiveness and experience. A partial list of space partners, property owners and managers with whom we've worked to bring programs to public space since 2009. A partial list of program partners, individuals and organizations with whom we've worked to bring programs to public space since 2009. WBUR [10/15/09] "In Chinatown, Borrowed Books On Borrowed Time"
Boston Globe [9/21/09] "Residents Hope Storefront Library is Preface to Branch"
Boston Globe [9/25/09] "Storefront Library Exposes Gap"
Neighborhood Network News [12/11/09] "Chinatown Storefront Library"
Architecture Boston—The Lurker "Lending a Library"
Boston Herald [1/17/10] "Experimental library closes in success"
Sampan [2/5/10] "Storefront Library and Films at the Gate affirmed, civic institutions continue to grow and adapt." Sampan [11/20/09] "A work in progress, the Chinatown Storefront Library grows with its community." Eric Hellman: "Back to the Future at the Storefront Library"
Richard Kong: "Chinatown Storefront Library"
Asian/Pacific American Librarian Assn: Chinatown Storefront Library in Boston"
Bryan Loar: Brave New World "Pop-up Libraries"
PLA Blog "The Chinatown Storefront Library"
Asian Voices for Organized Youth for Community Empowerment "Chinatown Storefront Library by MeiHua Li, Oak Terrace"
Movements and Moments: Ethnic Studies and Asian American Activism "Open Mic at the Library"
Wong/Yee Memorial Gallery "Come to the Exhibit Opening of Insert: Collaborations"
The Chinatown Blog "Letter from Chinatown Storefront Library"
Should Libraries aim for Third Place? View all of our blog posts about the Storefront Library here.